The big brains, curiosity, and extraordinarily social behavior of dolphins make them ideal subjects for the projection of human hopes and aspirations. While it may be impossible to eliminate the human tendency to anthropomorphize completely, our fascination with dolphins has led to claims that they are more evolved than humans or that they even have extraterrestrial origins. Such distortions not only do violence to dolphins, but to ourselves, in that they keep us from experiencing the authentic personal development that encounters with dolphins can actually provide. Integral Deep Listening is a phenomenological approach to personal development, and we both teach and encourage such an approach on our yearly excursions to swim with the wild spotted dolphins of Bimini. Phenomenological approaches encourage the suspension of assumptions, interpretations, expectations, and belief systems regarding what we experience in favor of cultivating an open-focused, receptive awareness which allows us to be touched more deeply than our cultural and social scripting normally allows. For example, the word “dolphin” is a place holder or marker for an actual experience; functionally, our words stand for our experiences and actually replace experiences with purely subjective reproductions of them. Such place holders can be immensely powerful. The word “lemon” can make you salivate. The word “shark” can create the physiological reactions of the alarm phase of the “fight or flight,” or General Adaptation Syndrome. But while such mental representations are powerful tools for comprehension and growth, they also disallow the full experiencing of lemons, sharks, and dolphins. Our meanings get in the way of living now, and that stunts our development. Integral Deep Listening attempts to compensate for the human addiction to meanings and the resulting blockage of raw, vital, and potentially transformative experience by not only encouraging the suspension of such meanings during dolphin encounters, but by asking, “If meaning-making, projection, anthropomorpization, and interpretations of dolphins are unavoidable, what framework is likely to do the least violence to their authentic natures while opening us to the greatest possibilities for personal development?” To this end, IDL assumes that all experiences are best framed as wake-up calls. What this means is that whatever happens to you and whomever you meet, including a dolphin, is best viewed as an opportunity to wake up. “Waking up” means more than paying attention. It means to move toward integration of body, mind, and spirit, toward personal fulfillment, collective interdependence, and enlightenment. Furthermore, IDL assumes that waking up can be usefully framed in terms of six core qualities that describe the round of breath, day, seasons, and the life cycle itself. These are confidence, compassion, wisdom, acceptance, inner peace, and witnessing. IDL therefore asks of a dolphin encounter, “How can I use this experience to wake up?” “How can I use this experience to evoke and expand these six core qualities associated with waking up within me today and long after this encounter?” Many teachers, trainings, and excursions offer transformative experiences, but they rarely last. This is because temporary states are not stable, habitual, lasting stages. A goal of IDL dolphin encounters is to turn a marvelous temporary state of freedom, floating, light, and oneness into an ongoing life that is imbued with more of those qualities. In order to do so we need to understand these six core qualities and how they operate. We then approach encounters with dolphins within that context. We then learn to approach all encounters with others in our daily lives in terms of those qualities. What are these six core qualities and why are they of central importance? First, there is no one formulation that is best or that will work best for everyone. What is important is that we transcend and include formulations that keep us asleep and experiment with using those that make sense to us and that seem to have a reasonable chance of waking us up. Close observation of the breath reveals that it has six parts, an abdominal inhalation, a chest inhalation, a slight pause at the top of the breath, a chest exhalation, an abdominal exhalation, and a longer pause at the bottom of the breath. This cycle is mediated by the autonomic nervous system, which means that it is mostly unconscious, and can be observed during sleep in animals as well as humans. It is also under the control of the central nervous system, which means that we have the ability to change the rate, depth, and focus of this fundamental life cycle. Each of these parts or stages of breathing can be associated with life processes that, while evident throughout the cycle of breathing, are most pronounced at this or that particular stage. Abdominal inhalation is rebirth and awakening. It is new growth and new life. Chest inhalation is aliveness, expression, and growth. The pause at the top of the breath is a balance point between the alertness that inhalation brings by supplying oxygen to the cells of the body and brain, and the relaxation that each exhalation provides. Chest exhalation is a letting go of life and energy and a detachment from them. Abdominal exhalation is a more profound surrendering, death, and freedom. The longer pause at the bottom of the breath is a space of deathlessness, openness, and clarity. A little contemplation discloses that this same cycle can be observed in daily life, in the round of seasons, and in the round of life. Consequently, the breath can be used to anchor many different realms of experience and collect and sort through many systems of meanings in a way that tie back to this moment and this breath. It can be effectively used to direct experience in this moment, prior to the meanings that language imposes on life. Each of these stages can also be associated with the six core qualities that are in turn associated with awakening. Abdominal inhalation, as a primal awakening and rebirth, is a death-defying, fearless confidence. It is the negentropy or building up of the universe that defies the law of entropy or running down predicted by the laws of physics. We see this mindless, brazen confident fearlessness in the sprouting of a seed and in the brashness of baby animals and humans. Chest inhalation, as the personification of aliveness, is seen in human curiosity and exploration and finds its fullest expression in a life of selfless, compassionate service. The pause at the top of the breath is not only the rare gift of balance in life but the wisdom that such balance both assumes and generates. Chest exhalation is both acceptance of oneself and others and detachment from the drama of others, our circumstances, our thoughts and emotions. Abdominal exhalation is the inner peace that freedom from those dramas produces within us. The pause at the bottom of each breath is the objective witnessing of both internal and external drama as well as of the cycle itself. When you free dive with wild dolphins you are much more aware of your breath than you otherwise might be. This is because your ability to hold your breath translates into an ability to share the experience of the world that dolphins experience. The best free divers have learned that thinking takes energy and that learning not to engage thoughts or feelings translates into longer diving time. Consequently, meditation, which is most fundamentally a process of learning to witness or observe the contents of our awareness, is not only important to transformative dolphin encounters, but to developing the phenomenological perspective that allows us to be deeply touched by these extraordinary beings beneath the matrix of our linguistic meanings. 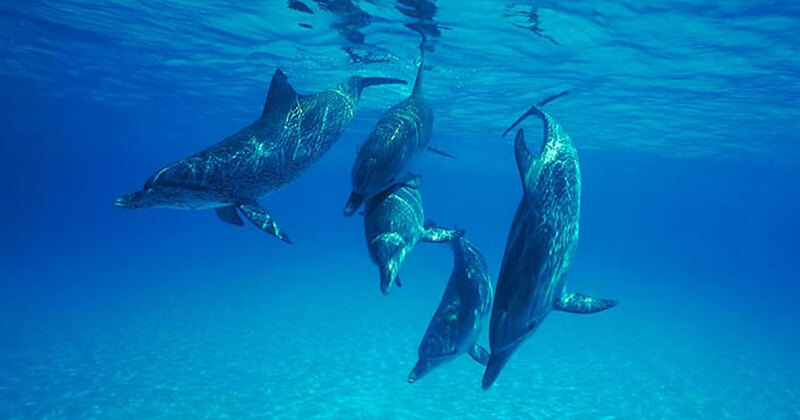 In using meditation to develop the breath control necessary to experience longer free dives with dolphins we can learn to follow our breath with our awareness and at the same time build a sense of unity with dolphins and with all creatures that share this cycle of breath, the associated stages of life, and core qualities that support all life in a foundational way. What does it mean to experience life in general, and dolphins in particular, in terms of these six core qualities? First, we have to consider what it means to experience ourselves in terms of these six core qualities. What does it mean to be confident and fearless? At worst, it means to foolishly ignore genuine danger. At best, it means to identify with a definition of self that does not die and that therefore does not fear. What would it mean to experience a dolphin in such a context? What would it mean to experience your friends, associates, co-workers, and family in such a context? What does it mean to be compassionate? Compassion is different from love, because love has as its opposites fear and hate. Compassion embraces both love and its opposites. A good model of compassion is the sky, which gives of itself unreservedly to be inhaled for the sustenance of all living things and which also receives what is exhaled from the earth and its creatures with equal completeness. At worst, being compassionate means to be enslaved by social conscience, by the “oughts” and “shoulds” of our childhood scripting. At best, it means to give and receive completely and selflessly. What would it mean to experience wild dolphins in such a way? What would it mean to experience your daily life in such a way? What does it mean to be wise? Wisdom is different from intelligence, be it test-taking ability, street smarts, charisma, mathematical ability, or the mastery of this or that aptitude. Wisdom is intuitive knowing. It is the ability to be in the right place at the right time in order to say or do that which will awaken yourself and others. At worst, wisdom is self-righteous self-assurance, of the type seen in those who have mystical experiences and think their truth is the truth for others or in those who have had the good fortune to have money and status and believe that makes them special. At best, wisdom is balance of body, mind, and spirit, in work and play, in self and relationships, in life and death. What would it mean to experience wild dolphins from a space of such wisdom? What would it mean to experience your daily world from a space of such balance? What does it mean to be accepting? At its worst, acceptance is ignoring important distinctions and betraying your responsibility to discriminate. It is accepting things in yourself and in life, such as social injustice, that are not to be accepted. At its best, acceptance is about not taking anything personally. It is about realizing that life is not about you, that if you hadn’t been born but some other child had been, your parents would have treated that child pretty much the same way you got treated, if it behaved in a similar fashion. It is to understand that the thoughts you think and the feelings you feel aren’t really about you; they are automatic programs that are highly predictable and are mostly about drama, not living. Real acceptance gets you out of the way so you can hear and see dolphins, others, and yourself. What would it mean to experience wild dolphins from a space of such acceptance? What does it mean to have inner peace? At worst, inner peace is lazy complacency. At its best, inner peace is freedom from stress and drama. What would it be like to experience dolphins from such a perspective? What would it be like to shift your values in such a way that you routinely experienced your daily life from a space of inner peace? What does it mean to witness? At worst, witnessing is an insulating numbing and dissociating that protects you so that you can die more comfortably. At best, witnessing is freedom from drama. That drama is easily understood as the endless repetition of the three roles of victim, rescuer, and persecutor. When you are in these roles when you experience wild dolphins you do not see them, you only see this or that role. When you learn to witness, you no longer need to rescue dolphins nor do you see them as rescuers of the planet. You no longer need to persecute those who hurt dolphins or their environment, nor do you need to see those who do as persecutors. You no longer need to see dolphins as victims of the stupidity, greed, and cruelty of humans, nor do you need to see yourself as a co-victim of environmental degradation. Can you move to such a perspective? If you do, how would it change your ability to experience wild dolphins? How would it affect your relationships with others and how you feel about yourself? These six core qualities are together antidotes to the drama of victimization, rescuing, and persecution that keeps both humans and dolphins locked in a dance of mutual destruction. Compassion and acceptance are natural antidotes for rescuing. Wisdom and fearless confidence are the antidotes for persecution. Inner peace and witnessing are the natural antidotes for the role of victim. Integral Deep Listening develops these antidotes through interviewing dream characters and the personifications of life issues. For instance, if a participant in a dolphin encounter is afraid of sharks, that fear is given a color and that color is turned into a shape or form, like a ball or an animal, and is then interviewed in such a way that the fear is heard and the participant wakes up. Repeated interviews within the culture of a group invested in outgrowing drama and embracing the core qualities creates an environment that allows participants to use their encounter with wild dolphins as a way to heal, balance, and transform their lives. At the beginning of your meditation, set your intent. What do you want to do and not do during your meditation? What are you attempting to accomplish? As you begin to center yourself, focus on your exhalations. Exhale your thoughts and feelings with each exhalation in order to calm your mind. During meditation, if you have thoughts, feelings, images, or sensations, exhale them. If you have drowsiness or lack of focus and energy, focus on your inhalations to bring more clarity with additional oxygen. Allow your abdominal inhalations to increase wakefulness and confidence. Allow chest inhalations to increase aliveness and compassion. Allow the pause at the top of the breath to increase balance and wisdom. Allow your chest exhalations to increase your detachment and acceptance. Allow your abdominal exhalations to increase your sense of freedom and inner peace. Allow the pause at the bottom of your breath to increase centeredness and witnessing. Here is a protocol for setting intention at the beginning of meditation. Create your own. Most people sit down to meditate without having clear intent. Maybe it is to be a time of focusing or concentrating attention, to observe breath, to relax, visualize, get guidance, or enter a higher state of consciousness. When meditators do not clearly set their intent, competing intentions, often out of awareness, conspire to disrupt the meditation period. Rightly understood, meditation is a practice of bare intention, without content. It strengthens and clarifies intent by preferring it to other aspects of experience, such as thought, emotion, visualization, sensory stimulation, relationships, or accessing different or higher states of consciousness. Subsequently, IDL recommends that you begin every meditation session with a statement of your intent. What follows is an example of a statement of intent based on IDL. Use it as a source of ideas for creating your own. When you arrive at something you like, print it out and read it over before you meditate until you can repeat it in your thoughts. “I am here to meditate. or talk to myself in any way. With every out-breath I exhale whatever thoughts arise. When feelings arise, they are like weather; it isn’t about me. With every out-breath I exhale whatever feelings arise. to look at anything or to visualize anything. When images arise, they seem inconsequential, like a mirage. With every out-breath I exhale whatever images arise. of heat and cold, pain or relaxation. I am not here to explore kundalini or chakra energies. they exist, but they are relatively inconsequential. With every out-breath I exhale whatever sensations arise. If such shifts occur they are not about me. “I am here to become the sky. since I cannot die and nothing can hurt me. I am completely awake and aware. I inhale Joseph’s fear and unconsciousness. for them to use me as they wish to live more fully. I am compassionate in that I completely take in whatever they exhale. I inhale Joseph’s selfishness and laziness. because I am in all things and therefore know all things. I inhale Joseph’s ignorance and imbalances. and do not judge what goes on above me or below, in the world. I inhale Joseph’s non-acceptance, attachments, and addictions. I inhale Joseph’s stress and imprisonment. because I observe the dramas of life and nature without identifying with them. As the sky I am clear and empty. I inhale Joseph’s enmeshment in drama and his cloudiness. I am transparent and luminous. because of their dreamlike nature. “As the sky, I am prana. The second part of the statement defines meditation positively and experientially, by asking you to become the sky and experience what life is like from its perspective. While it is obvious that the sky is a metaphor for a perspective of pure witness, it is also a metaphor for the five other core qualities of enlightenment referenced here. You are asked to experience yourself as each of them, from the perspective of sky. The third part of the statement is based on the three refuges of Buddhism: “I take refuge in the Buddha, in the Dharma, and in the Sangha.” “Buddha” means “the enlightened one,” or one who is fully awake, yet with no self. “Dharma” means law, or organizing structure, or truth. IDL sees these as perspectival: totally dependent upon one’s perspective. As a consequence the dharma is not only dreamlike; we are free to choose how we view it. IDL recommends that whatever structures exist in your life, whether they are helpful or hindrances, be viewed with joyful absurdity. “Sangha” is the Buddhist word for spiritual community. In IDL there are two sanghas, your internal, or intrasocial support community, which you encounter and evolve through interviewing and application, and your external support community, made up first of peers and teachers in IDL, then by others who share its values and culture, and finally by the entirety of your waking identity and its social environment: all sentient beings. To fully recognize and embrace these two sanghas is to experience outrageous, unlimited abundance. The next part centers your sense of who you are in sky and as sky as prana and breath, not as your body, thoughts, or feelings, as you normally do. The final part centers you in the sacredness of this moment and this moment and this moment as sky, as tens in each of the six core qualities. At the end of your meditation it is important to set your intent for whatever comes next. Ask yourself, “What thoughts and feelings are likely to come up or get in the way the next time I meditate? What can I do between now and then to reduce them?” Do those things, and watch your meditation improve.